SimilarSites.com Launches New Competitive Intelligence Features! SimilarSites.com partnered with Feng-GUI, a visual analysis company, to incorporate their eye tracking simulation into the SimilarSites results. 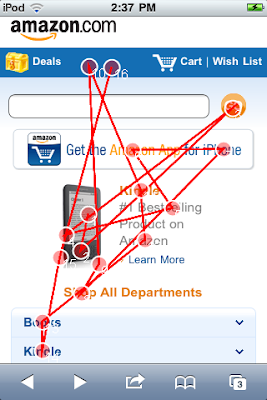 The new “Heatmap” tab shows a screen shot of a website’s homepage along with the corresponding color-coordinated image which predicts how a human eye views the website upon first arrival. Heatmaps for four similar websites are also shown which makes for easy competitive comparisons. Knowing that on average, website owners only have 5 seconds to capture users attention, this technology enables webmasters to optimize the placement of content to maximize the chances of capturing users attention. SimilarSites.com has made changes to its algorithm that deliver more targeted similar website recommendations. Websites are now characterized by specific tags, leading to a convenient browsing experience, ideal for competitive research. 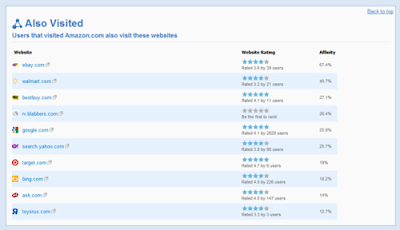 The “Also Visited” results, which SimilarSites.com is one of the few websites around the web that provides this service, delivers a list of 10 websites that a person who visits a website is also likely to visit. The results are calculated and show their corresponding Affinity Score, a measurement of the likelihood that someone is going to visit another specific website. Lastly, the Top Sites results have also been improved which show a birds eye view of up to 25 similar websites based on a related topic or category. Keyword Density measures how many times a specific word is used on a webpage in comparison to the total amount of text on that specific page. It can be used to gauge the quantity of specific content used in a website, which can play a major role in page rank and search positioning. The revamped SimilarSites.com results calculate and show the keyword density for a website’s top 15 terms. With the click of a button, a user can find similar websites that also share Keyword Density for a specific word. The comparative feature can be used to understand which websites share similar keywords. Overall, these improvements have made Similarsites a more resourceful tool for anyone doing competitive Internet research. Visit SimilarSites.com to see the new changes and start discovering similar websites today. Q: What is usability testing? What is remote usability testing? A: Usability testing is the process of having people interact with a website and provide feedback on it. The purpose of this testing is to find out why users are using the site as they are. The value in understanding why users behave a certain way is that you get actionable insight, which raw data on what users are doing doesn’t tell you. You can see what’s tripping up users and fix it!